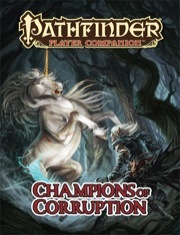 Claim what’s rightfully yours with Pathfinder Player Companion: Champions of Corruption! Summon monsters from the blood of your enemies with twisted Sarkorian magic, lord over your minions to further the causes of your dark masters, and use any means necessary to achieve your despicable goals. With Champions of Corruption, everything is fair game as long as you prosper and your enemies suffer. Detailed explorations of the lawful evil, neutral evil, and chaotic evil alignments, including example personas for your vile character. New archetypes: the sanguinary blood summoner, the godless dread vanguard, and the bloodthirsty raging cannibal. Savage new traits for characters who hail from dark lands, and rules for wicked ones who seek to lord over Golarion’s most debased nations and organizations. Cruel new options like Vile Leadership and damnation feats, which let you use coercion and violence to compel your cohorts and allies to commit even greater atrocities. Brutal new spells, magic items, and other sinister options to sate your bloodlust and strike fear in the hearts of heroes who would oppose you. Written by Paris Crenshaw, Jim Groves, Sean McGowan, Philip Minchin. Cover Art by Claudia Schmidt. Champions of Corruption does not disappoint. While I would consider it my least favourite of the three alignment books, it's still a very good book, offering an in-depth look at what it means to be evil and providing interesting options for evil characters. And just because it's a Player Companion doesn't mean that it's just for players. GMs can get a lot of use out of this book to flesh out villainous NPCs. This gives good advice on different types evil characters under different evil alignments and how to play them with other characters whether they are off same alignment or not. Even if you don't plan to play as evil characters, this seems pretty useful for creating villains as well. However, I think this could have gone farther than this. Most of examples are just "evil for evil/selfish reasons" types of personalities, while motivations list in beginning had potential for more different types of evil. Would have been interesting to see example of tragic villains, like vengeance driven evil character who is ready to do anything to accomplish his revenge. There also wasn't any mention of playing good or neutral characters turning to evil, fallen hero would have been interesting character example as well. So yeah, if you are interested in trying out evil characters, sure go for it, but if you aren't that interested, this won't convince you to play evil character nor probably would convince your GM to let you play as one if they are against it. Read this review in full at A Gaymer's Quest! 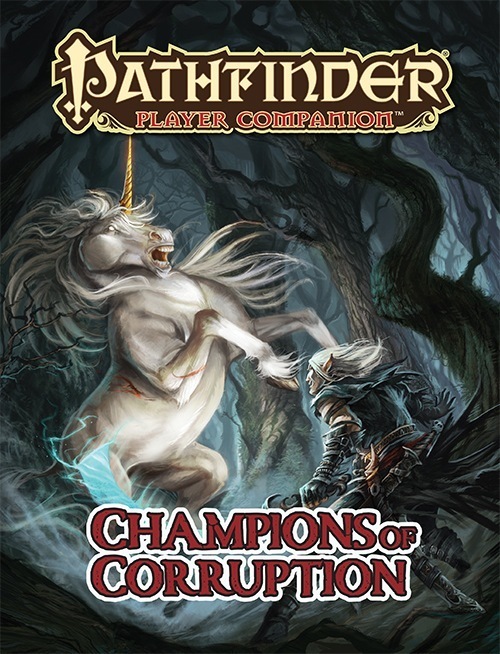 Paizo’s September 2014 Player’s Companion release is Champions of Corruption. The final book in the Champions of series, this guide is focused on helping players develop evil characters and ground them in the evil organizations that plague the Inner Sea. From the beginning, you can see that the designers took this task seriously. On the front cover, Seltyiel is killing a unicorn. I kind of like that the unicorn doesn’t look all that good though. It would be a lot harder to see Seltyiel killing something that looks super sweet. Rather, it’s milky white eyes make you think that perhaps the unicorn is the corrupt one and the iconic is trying to defend himself. In fact, throughout the entirety of the book, the art makes it clear that these are not characters to trifle with. The guide’s inside covers feature familiar material to other readers of the Champions of series. On the front inside cover we have a chart detailing the evil gods. This could actually be really helpful during character creation. I think I may pull out the ones from Champions of Righteousness & Champions of Balance next time the party has to make characters. I’m hoping this will be helpful both for world immersion and for reminding them that it would not hurt to have an actual healer in the party. Much like the previous two Champions of books, this one closes with a feat improving the character’s ability to summon evil monsters. Like the other two, when a character with this feat summons a creature off the evil monster list, the summoning takes only a standard action. Normally the “For Your Character” and “Rules Index” two pages seem like waste to me that could be much better filled with world-building or crunch product. Here Paizo has introduced ideas that are interesting about how they frame evil—certainly ambiguous. They’ve included a “Did You Know” box about Hermea and the inherent disagreements about how to characterize Mengkare’s alignment. Newsflash: Paizo staff can’t even agree as to whether or not Mengkare’s experiment is interesting to him or actually among the most diabolical things happening in the Inner Sea region. Adopting this viewpoint makes sure that any game taking place in Hermea is that much more interesting by giving us a rationale on how a character’s complex motives could make it evil or not in the eyes of some beholders. Read the rest of this review online at A Gaymer's Quest! This looks awesome. I was hoping to see this eventually. Strange- why did I think there was already a book for evil characters? Not that I'm complaining, mind. It's good to be bad. There is a decent amount of Evil-centric material floating around, even if it isn't in a product dedicated just to that. Doubly so if you go along with the horde believing that Hellknights are inherently Evil, etc. Maybe you were thinking of Faiths of Corruption? I'm also glad to be seeing evil PC support, though. That's okay, you're not the only one. Occam's razor, dear boy. He saw Faiths of Corruption and became confused. Oh, I'll bet there's a section for help with including evil PCs in good/neutral campaigns, something my group is quite fond of. Meh! not much of interest for me on this one. Don't you have evil NPCs? You know, along the lines of the excellent sidebars in Champions of Balance(particularly on what Chaotic Neutral is not) and Purity("just because someone is evil doesn't mean they deserve to be murdered, srsly guys"), I hope there's similar stuff in here. Like how to have a coherent group with evil characters(probably most important for CE PCs), Evil characters with standards. Stuff about how evil characters might compartmentalize their lives. Advice for "noble demon"-style evil characters. How evil characters can have nuance beyond being complete monsters. How to play evil sympathetically and in a way that can make a non-evil party want to keep you. How evil characters of some organizations and faiths might get on relatively well with certain good organizations and faiths. edit-A sidebar on player-side responsibility for respecting the comfort zones of other players may be worth the pagespace too. That said, I'm certainly expecting some new antipaladin spells here...I was quite disappointed when the demonic spells listed in Sword of Valor didn't include a single antipaladin spell. Well, really, I hope for lots of spells and options for all classes...diabolical magi, fiendish summoners, dark wizards, sorcerous thralls to greater evils, clerics and oracles serving dark gods and pantheons/forces, witches with infernal patrons...but whatever we get, should be fun! Tim and Jim! Two of my favorite people on the same product! Huzzah! We've needed this for a long time. I really hope they make the Anti Paladin class a lot better with it and give evil characters a lot of ways to feel important for a change. If you put this book next to Champions of Purity on the same shelf, will they explode? One of my favorite aspects of Paizo products is the fresh ideas that are sprinkled throughout (if not wholly made of said fresh ideas. Looking forward to this one, but to be fair, I'm always looking forward to new Paizo stuff. That is why you need to buy Champions of Balance to use as padding. What I want Paizo to avoid in this book is to give evil characters super-duper-powerful abilities/spells, which are blatantly better than the stuff given out in Champions of Purity. Because that would play again into the stereotype that "evil is better than good", which I hope Paizo can avoid for once. Chosing evil should certainly have its rewards, even if they are more short term than those of good. Hopefully this book has some stuff for non-chaotic antipaladins. Will there be an Evil Outsider Quality summoner evolution? Now i want a Champions of Order, Champions of Madness, and a Champions of Non-commitment books. Champions of balance had two archetypes. But they aren't going to change paladin/antipaladin alignments in a campaign setting book. Ah, you're right, my bad. Negotiator for bard and survivor for druid, that's right...but I still think it's dubious they'd put something like that in a player's companion. Hey, the people on the couch need champions too. Removed a post. Please don't do this thing. Better not be. I want some cool new options for my Inquisitor of Murder. Chance for a nightmare mount? Oh god please have a summon monster (evil) feat. Considering we have a Summon Good Monster and Summon Neutral Monster feat, I'm sure they'll round it out with a Summon Evil Monster feat. And hey, you can always try to track down a nightmare to serve as your steed in-character! This looks like it is going to be a great book! For those who like Law vs Chaos more than Good vs Evil? I would love champions of chaos and champions of order books. Champions of Order and Champions of Anarchy/Discord seems like a logical place to go. It also might give insight on things like "Can a paladin and a LE character actually find ways to co-exist and even agree on things, compared to other members of the party?" Maybe Champions of Harmony for the Neutral book. +1 for Champions of Order, Chaos, etc. ... but only if they can avoid re-treading ground already covered in Purity/Balance/Corruption. Aside the Magus, will there be any Iconics in it? This kind of book will probably have perfect artwork for a lot of my bad guys. Can't wait! My guess is they will have the Magus for LE, Slayer iconic for NE (guess on his alignment, could be way off), and use the sample art for the example Antipaladin for CE. I am curious how this book will turn out. Could prove useful for NPCs.